Simon & Schuster/ TED, 9781501119989, 128pp. Discover the unexpected pleasures and exciting possibilities of talking to people you don’t know—how these beautiful interruptions can change you, and the world we share. When Strangers Meet argues for the pleasures and transformative possibilities of talking to people you don’t know. Our lives are increasingly insular. We are in a hurry, our heads are down, minds elsewhere, we hear only the voices we already recognize and rarely take the effort to experience something or someone new. Talking to strangers pulls you into experiences of shared humanity and creates genuine emotional connections. It opens your world. Passing interactions cement your relationship to the places you live and work and play, they’re beautiful interruptions in the steady routines of our lives. In luminous prose, Stark shows how talking to strangers wakes you up. Threaded throughout are powerful vignettes from Stark’s own lifelong practice of talking to strangers and documenting brief encounters, along with a deep exploration of the dynamics of where, how, and why strangers come together. Ultimately, When Strangers Meet explores the rich emotional and political meanings that are conjured up in even the briefest conversations and unexpected connections with strangers. Stark renders visible the hidden processes by which we decide who to greet and trust in passing, and the unwritten rules by which these encounters operate. 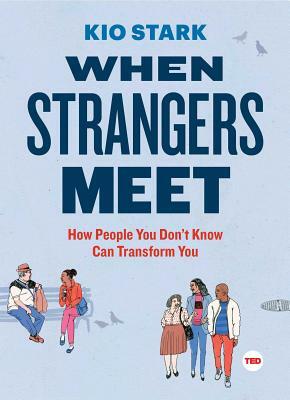 When Strangers Meet teaches readers how to start talking to strangers and includes adventurous challenges for those who dare. Kio Stark is the author of the novel Follow Me Down, the independent learning handbook Don’t Go Back to School, and When Strangers Meet. She writes, teaches, and speaks around the world about stranger interactions, independent learning, and relational technology.